“The investors who participated in our Series B financing round bring unique expertise within financial services and we’ll benefit from their knowledge beyond the value of their financial investment in Tyfone,” says the company’s CEO. MicroSD NFC device and solutions provider Tyfone has now released details of the investors behind last month’s $5m Series B funding round. The investors include a strategic manufacturing partner, further participation from existing investor Ojas Venture Partners plus two new investors — both based in India — HDFC Holdings and Polaris Software Lab. Tyfone will use the capital to accelerate production of SideTap MicroSD memory cards for mobile contactless transactions and scale the software side of its business, which includes mobile banking, couponing and loyalty solutions. 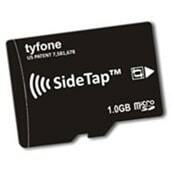 Tyfone first announced in January 2009 that it had developed a microSD-format NFC solution that could be retrofitted to existing mobile phones and was granted a patent covering the use of a memory card as an electronic wallet and the ability to use that memory card for the secure transmission of financial information later the same year. In March this year Tyfone announced it would be ready to field test its technology during the second half of 2010 and signed a deal with First Data that is expected to lead to the payments processing giant providing its customers with near field communication solutions based on Tyfone’s technology.